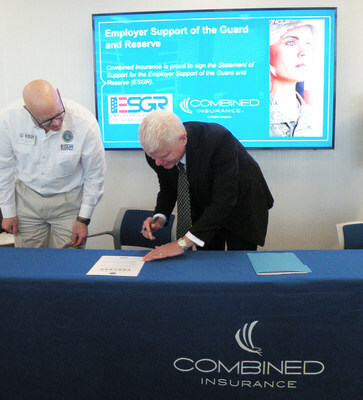 Kevin Goulding, President, Combined Insurance, signs the Statement of Support for Employer Support of the Guard and Reserve alongside Bob Nachman, City of Chicago Area Chair for ESGR. CHICAGO, May 14, 2018 /PRNewswire/ -- In demonstration of its continued commitment to supporting U.S. military servicemen and women, Combined Insurance participated in a Statement of Support for the Employer Support of the Guard and Reserve (ESGR) signing event, hosted at the company's headquarters. In addition to the signing, Bob Wiedower, Vice President of Sales Development and Military Programs, received two awards from the ESGR—the Service Member Patriot Award and the Spouse Patriot Award, respectively— for his military service and support for our National Guard, Reserve, and military spouse employees. "It's an honor for me to personally receive these two awards, and I am even more proud to continue Combined Insurance's support and partnership with the ESGR," Wiedower said. "Our company is committed to supporting our veteran community in many ways, whether it is through meaningful employment, volunteerism or corporate donations. Our ongoing support and partnership with the ESGR is one example of this, and one we are truly proud of." Established in 1972, the ESGR is a Department of Defense program that aims to foster a culture in which all employers support and value the employment and military service of members of the National Guard and Reserve in the United States. The ESGR's Statement of Support Program's intent is to increase employer support by encouraging employers to act as advocates for employee participation in the military. Combined Insurance has an A+ (Superior) financial strength rating by A.M. Best, one of the world's top insurance rating firms. The company has also been recognized for seven consecutive years on Ward's 50® Top Performing Health-Life Insurance Companies list. Furthermore, Combined Insurance has received numerous accolades throughout the years for its veteran-friendly hiring practices. Combined Insurance was named a Top 5 Military Friendly® Employer in 2018 by G.I. Jobs—marking the seventh consecutive year that Combined Insurance has made the Top 10 employer list and fourth consecutive year in the Top 5.